Hookbacks emerged from the Greater Ajax floating continent, but have since diversified. Those that still live there use the hooks on their back to grip vegetation so they don’t get tossed about by violent storms and waves. Others have taken on a variety of lifestyles, but are usually outcompeted by other red plant derivatives, and thus rare. Proansuliferae – Once counted as minor phylum on its own, a single genus of ansuliferans were thought to be endemic to the Greater Ajax. Later, species of hellamander and pillowworm were found to be related, and the group was fused into a much more substantial phylum. Proansuliferae have the basic tube-feet of basal red plant derivatives, a face emphasizing inner mouthparts rather than the typical ten outer tentacles, and two rows of soft hooks running down the back. Hellamanders – Misremembering the name of a North American giant salamander, a Helen observer christened this group. Unlike their earthbound lookalikes, hellamanders live in saltwater. Their faces are highly sensitive to touch, allowing them to forage blindly in sediment and vegetation. Pillowworms – Like termites and cows, pillowworms are highly adapted for subsisting on low quality plant matter. With the aid of microbes in their foregut, they can digest parts of plants no one else will touch. 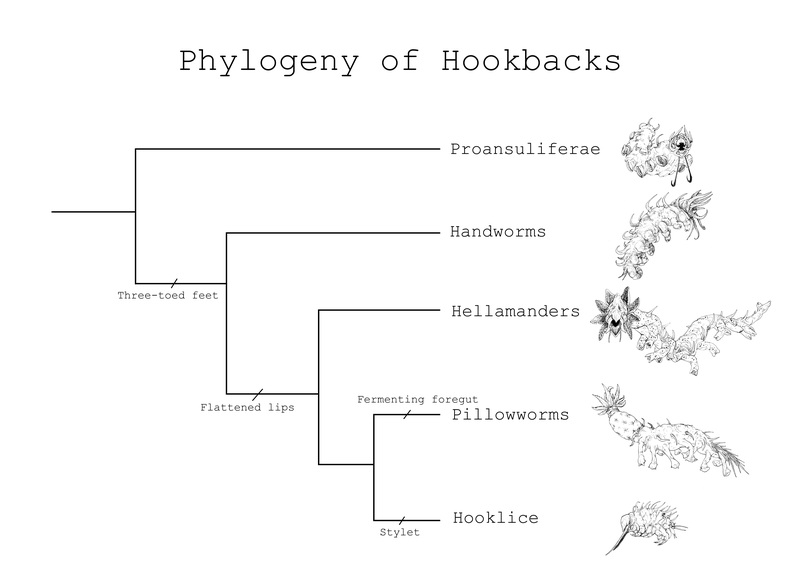 Hooklice – Hooklice are one of many plant parasites that have evolved a similar form, both on Ilion and on Earth. The stylet is formed of two half-tubed mouthparts, not unlike Earth’s true bugs.